Panna is taking off as one of grassroots sport’s most exciting and accessible new trends, combining football, acrobatics and an interactive spectacle. 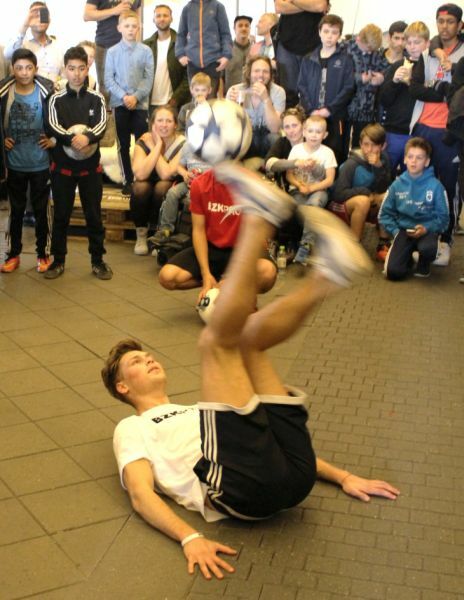 Some of the world’s best street soccer players shared their tricks with the participants at the New Moves Street Festival in Copenhagen on 10 April as a prelude to English Street Cup 2015. The list of street soccer stars at the "Style of Play Jam" session was long: Jeand Doest, Sean Garnier, Soufiane Bencok El Marnissi and Tobias Becs played against everyone who wanted to challenge them, from grownups to children. The event was organised by DGI Street Soccer, Bazooka Goals, English Football Freestyle community and Copenhagen Panna House, Denmark’s only panna community which also aims to promote street culture in Denmark. With free entry, street courts and panna cages ready for action, everyone could appreciate the freestyle shows, the rookie panna tournament and Seven-to-Smoke showoff with PRO players. From 16:00 to 23:00, Sean Garnier and other great street soccer players were playing and sharing with children who came especially for them and trying to giving them a panna: a ball played between their legs. “To us, Street Football means a free spirit. With our freestyle sport we take the ball and go wherever we want, then we improve our game and our style. We put our own touch on it and this is really important because we can represent our skills and style,” French star Sean Garnier. “Everything depends on where you are going – sometimes you have a lot of energy, sometimes not and you have to deal with it. It´s like a language: if you don´t speak to them they won’t be able to understand and enjoy it. So you need to connect with them and have the right energy. Most of the time we start with a freestyle show and make people gather around and afterwards they can challenge us”. “Freestyle it’s not the same as panna. With panna, you are interacting with people and can pick somebody out of the audience because we are on our own with the ball. You can talk to the children, and take the time to teach them some tricks,” he says.